In honor of tonight’s opening reception for the 2011 staff show, coordinator Jenna Kowalke-Jones has written a remembrance of the show’s namesake, James McLaughlin. Watch for part two tomorrow. 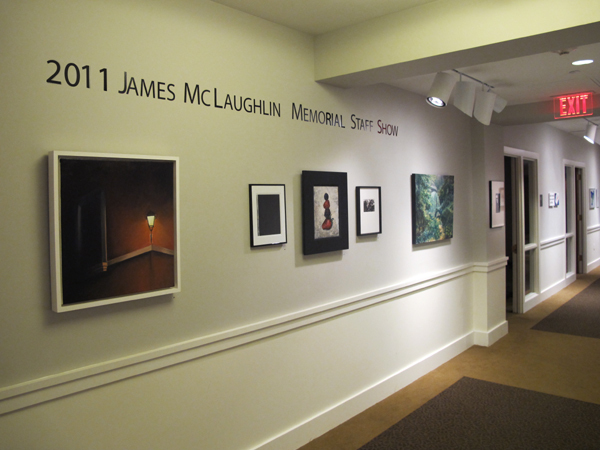 The Phillips Collection’s annual James McLaughlin Memorial Staff show opens this week, marking its 29th year. The first staff show opened in 1982 with an exhibition of paintings by James (Jim) McLaughlin (1909-1982) titled A Retrospective Exhibition: In Memoriam. McLaughlin’s family, in his honor, endowed the staff show in 1984. Artist, gallery preparator, and curator, McLaughlin’s contributions to the Phillips spanned five decades, and his legacy continues with the staff show. Detail of photo by Jane Godfrey from the show James McLaughlin Retrospective: In Memorium, 1982. Behind the scenes, the Phillips’s gallery preparators Shelly Wischhusen, Bill Koberg, and Alec MacKaye continue to carry out McLaughlin’s legacy when installing the staff show every year. Each has a story about how McLaughlin’s knowledge about the collection and art installation has been passed down, directly from McLaughlin himself. Librarian Karen Schneider commented on McLaughlin’s deep connection to the collection by saying that he lived with the art and “was a genius at installing art.” Schneider continued, “Jim was a hands-on person” who not only installed and curated the art, he built a close relationship with the Phillips family. This entry was posted in 90 Years of New and tagged Artists on staff, James McLaughlin, staff show. Bookmark the permalink. Jim was at the Phillips for 44 years and made it a point to look at what everyone was doing, a fine man and an old school artist on all four sides.